In my previous post , I explained abot the basics of Apache-Hadoop. In This post , I configured Apache Hadoop Pseudo Distributed Mode on a Single Node , for this i used Centos 6 .4 Linux Operating system. Make sure Java 1.6 or above is installed on your system. This will add the user hduser and the group hadoop to your local machine. Download the Apache Hadoop Common and move it to the server where you want to install it. You can also use wget to download it directly to your server in the /opt directory using wget. As hadoop user, unpack this package. Modify the hadoop-0.20.204.0/conf/hadoop-env.sh file and make sure JAVA_HOME environment variable is pointing to the correct location of the java that is installed on your system. Add the following snippets between the <configuration> … </configuration> tags in the respective configuration XML file. See Getting Started with Hadoop and the documentation in Hadoop’s API Overview if you have any questions about Hadoop’s configuration options. In a typical Hadoop production environment you’ll be setting up this passwordless ssh access between the different servers. Since we are simulating a distributed environment on a single server, we need to setup the passwordless ssh access to the localhost itself. 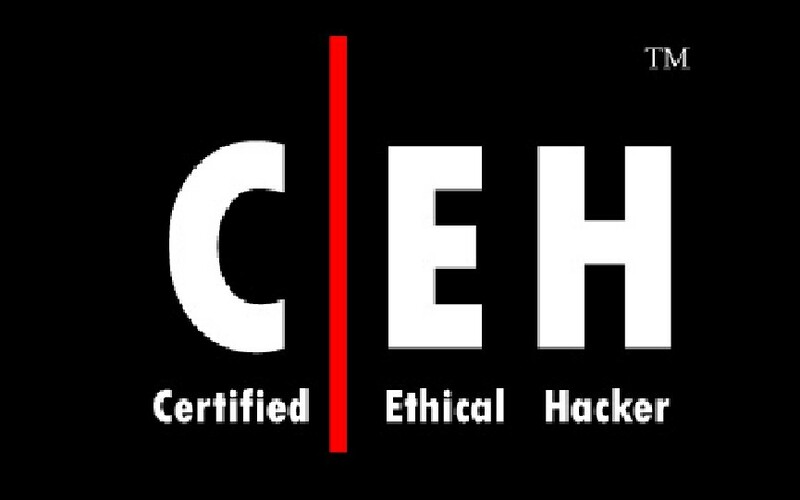 Use ssh-keygen to generate the private and public key value pair. Add the public key to the authorized_keys. Just use the ssh-copy-id command, which will take care of this step automatically and assign appropriate permissions to these files. 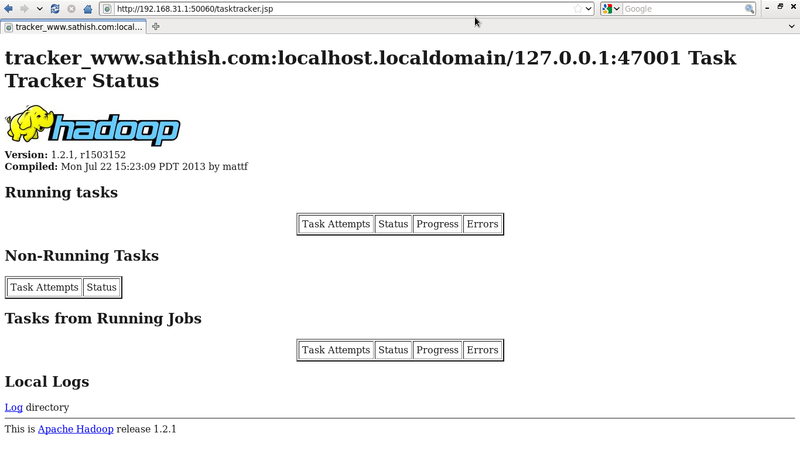 Test the passwordless login to the localhost as shown below. Use the /opt/hadoop/bin/start-all.sh script to start all hadoop related services. 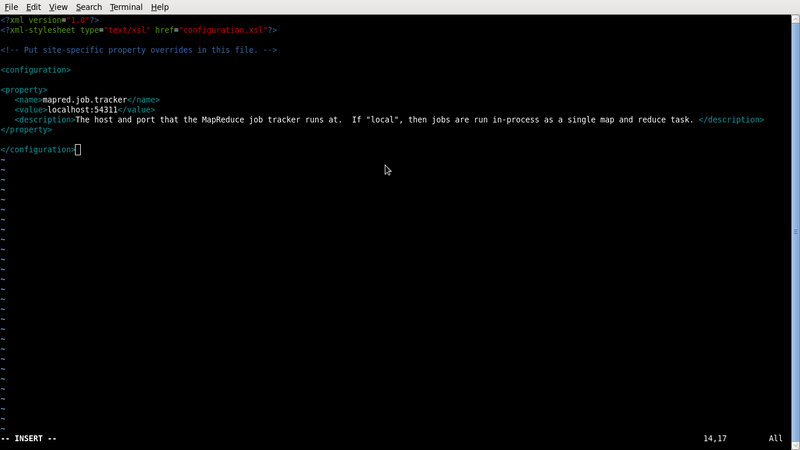 This will start the namenode, datanode, secondary namenode, jobtracker, tasktracker, etc. You can also check with netstat if Hadoop is listening on the configured ports. These web interfaces provide concise information about what’s happening in your Hadoop cluster. You might want to give them a try. The name node web UI shows you a cluster summary including information about total/remaining capacity, live and dead nodes. Additionally, it allows you to browse the HDFS namespace and view the contents of its files in the web browser. 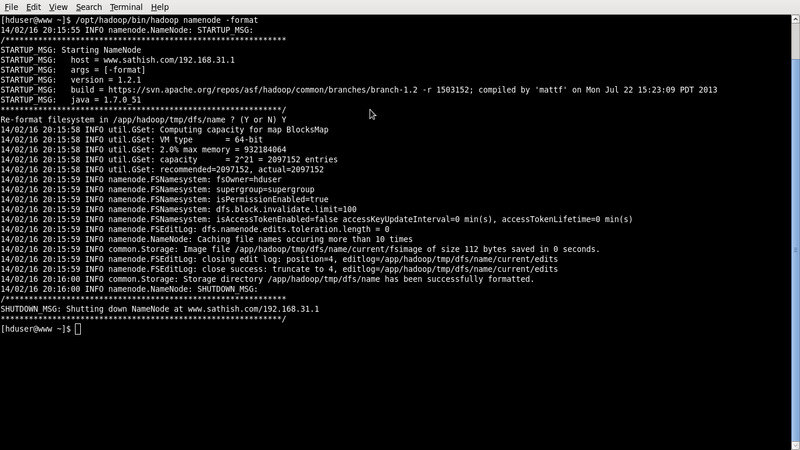 It also gives access to the local machine’s Hadoop log files. By default, it’s available at http://localhost:50070/. The JobTracker web UI provides information about general job statistics of the Hadoop cluster, running/completed/failed jobs and a job history log file. 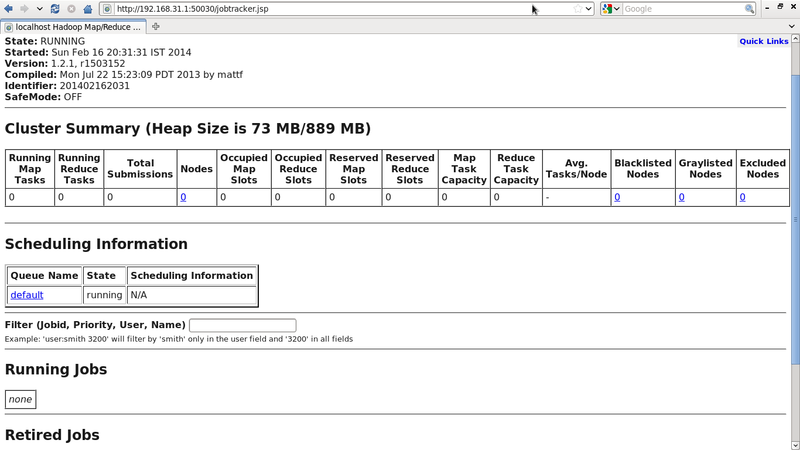 It also gives access to the ‘‘local machine’s’’ Hadoop log files (the machine on which the web UI is running on). 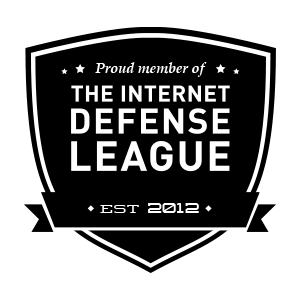 By default, it’s available at http://localhost:50030/. The task tracker web UI shows you running and non-running tasks. 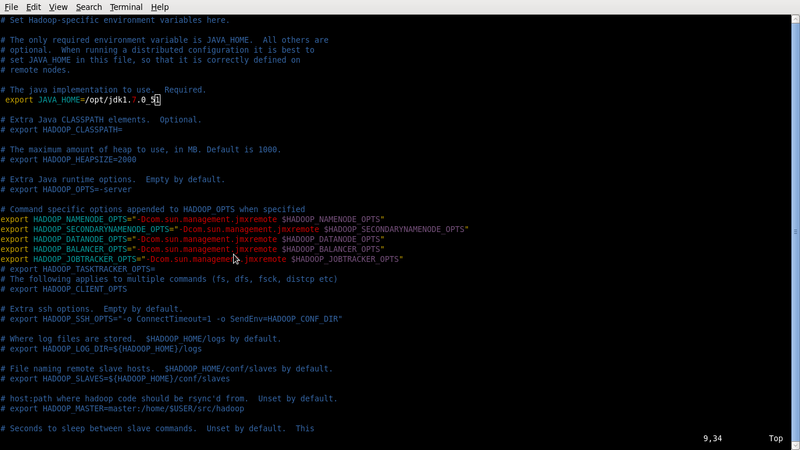 It also gives access to the ‘‘local machine’s’’ Hadoop log files. By default, it’s available at http://localhost:50060/. Simple example to see whether this setup work. for testing purpose, add some sample data files to the input directory. Let us just copy all the xml file from the conf directory to the input directory. So, these xml file will be considered as the data file for the example program. In the standalone version, you used the standard cp command to copy it to the input directory. However in a distributed Hadoop setup, you’ll be using -put option of the hadoop command to add files to the HDFS file system. 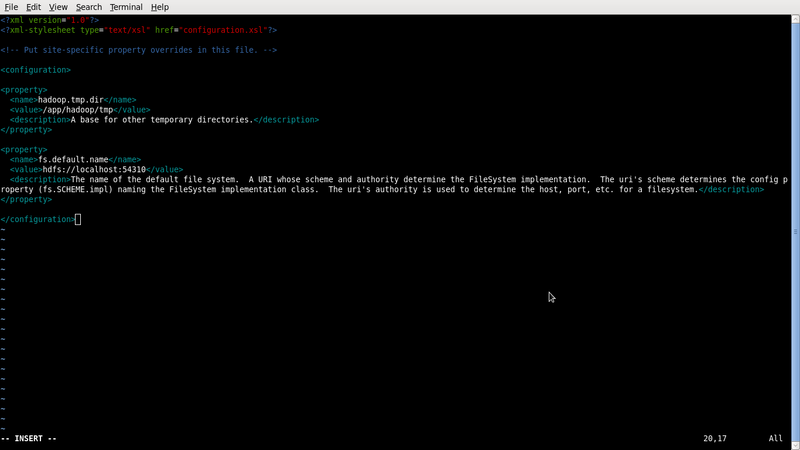 Importantly it’s not a Linux filesystem, you are adding the input files to the Hadoop Distributed file system. So, you use use the hadoop command to do this. Execute the sample hadoop test program. 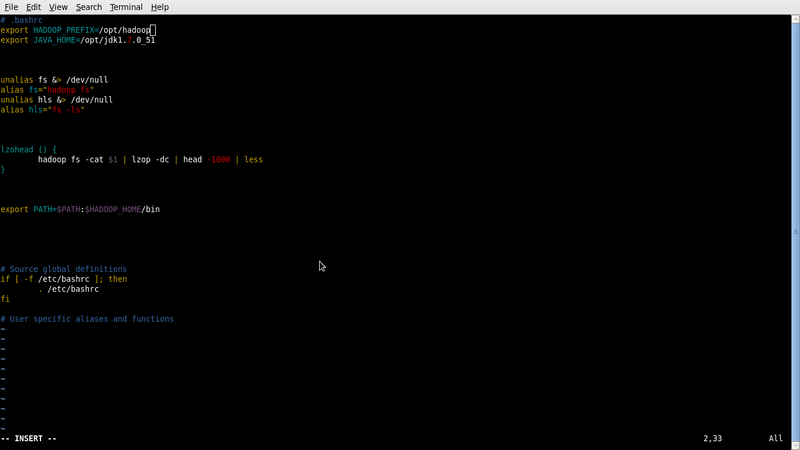 This is a simple hadoop program that simulates a grep. This searches for the reg-ex pattern “dfs[a-z. ]+” in all the input/*.xml files in the HDFS and stores the output in the output directory that will be stored in the HDFS. The above command will create the output directory (in HDFS) with the results as shown below. To view this output directory, you should use “-get” option in the hadoop command as shown below. it will show the output ,that’s it …. 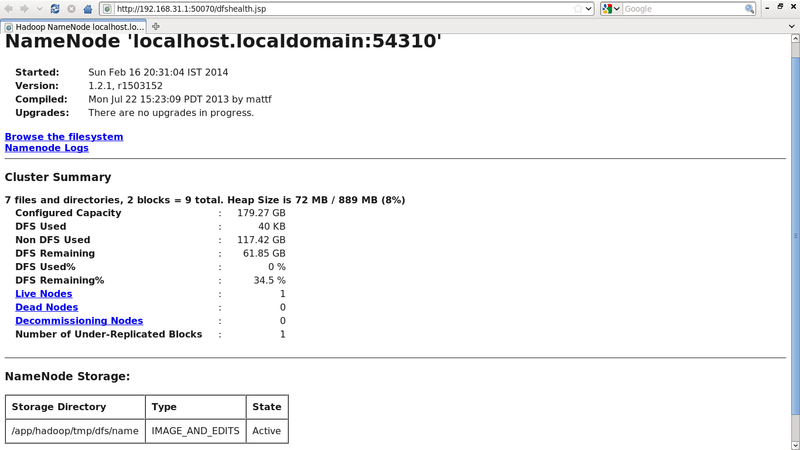 Coming posts I will describe how to build a Hadoop ‘‘multi-node’’ cluster with two servers. In addition, I will wrote a tutorial on how to code a simple MapReduce job in the Python programming language which can serve as the basis for writing your own MapReduce programs.